YOU FILLED MY BASKET WITH 30 WONDERFUL LOAVES!!! You thought about breads that were worthy of a famous knight from the middle ages, and, also, could please the palates of today’s guests of Schlosshotel Götzenburg. Not only your enthusiasm and creativity is amazing – your comments about medieval knights in general, and Götz von Berlichingen in particular, are highly entertaining. Götz von Berlichingen putting his iron hand to good use! Some of you even tried to figure out what practical considerations might influence a pastry chef’s decision on what kind of bread to choose – like using leftovers from the restaurant kitchen and easy availability of ingredients. By and by, I will try to bake all of your breads (I have started already). Also, I translated all German recipes into English and vice versa. So, if you don’t want to be at the mercy of Google-Translate (rather pathetic with bread formulas, but always good for a laugh! ), please contact me and I will send you the recipe. 28 enthusiastic bread bakers from 9 countries, from Canada to Dubai, helped me fill a basket with 30 different breads worthy of a Götz von Berlichingen. 1. Heritage wheats are not that easy to work with. The same is true for medieval bread grains that were around when Götz was fighting. But Barbara Elisi (Bread & Companatico) even coaxes a filigree crumb out of stubborn whole grain breads. 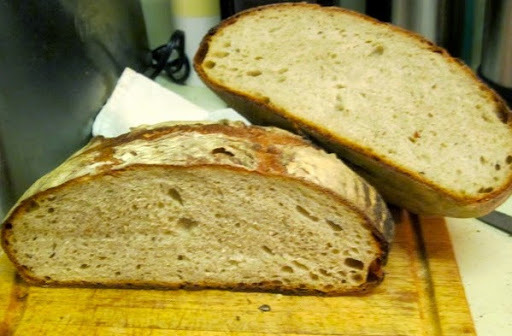 SICILIAN HERITAGE WHEAT BREAD FOR A GERMAN KNIGHT. 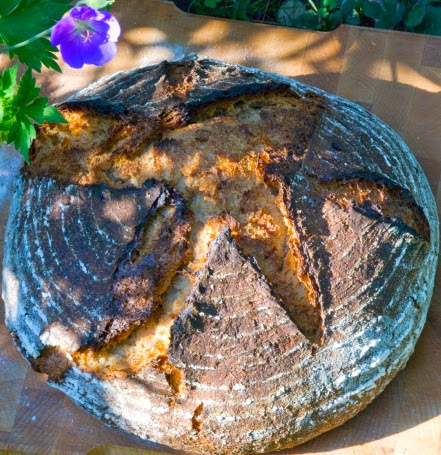 I already baked her bread, with Maine heirloom wheat – it tastes fantastic! 4. 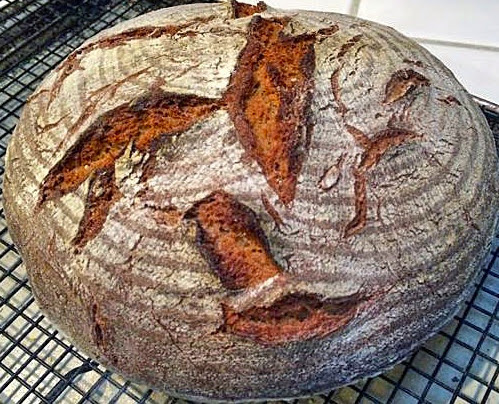 With her hearty POTATO-WHEAT-RYE BREAD FOR GÖTZ VON BERLICHINGEN, Britta (Brot vom Niederrhein) thought of the hotel guests’ well-being, but, also, of possible leftover usage in the restaurant kitchen. 7. Dabrownman (The Fresh Loaf), baker extraordinaire of grain loaded breads, felt so inspired by Götz’ life that he created two loaves in his honor. 9. Dagmar Kern (Brotecke) gave her mighty loaf a war-like name, and a matching fierce decoration to boot. Marked with a sword – and made with black ale, rye and spelt: just the right thing for a hungry knight and his guests! 10. 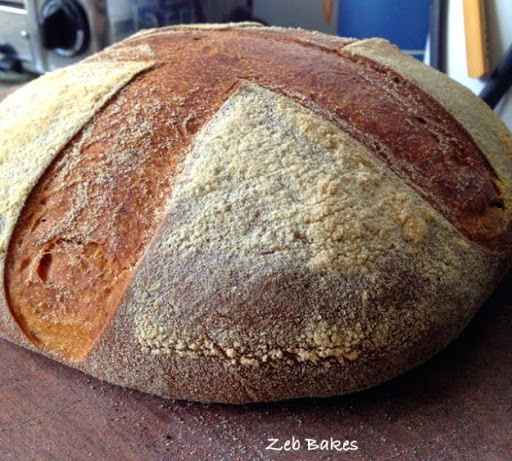 Daniel Ronay (Facebook/Baking 101) believes a hothead like Götz should have a robust bread that matches his passionate nature. His HOT CHILE-PEPPER LOAF FOR GÖTZ is seasoned with chile peppers. (Daniel doesn’t have a blog, please contact me for the recipe). 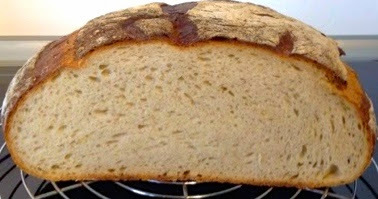 The trapped water in the porridge keeps the attractive breads moist for several days. 13. Dietmar Kappl, master baker at the renowned Reichl-Bäckerei in St Marien (lucky Austrians! 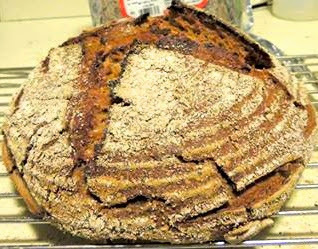 ), shares some his wonderful breads in his Homebaking Blog. 14. He didn’t find a medieval bread recipe during his research, but Don Sadowsky, author of the wildly popular “Really? Authentic Bread?” unearthed a “tough as Krupp steel” Komissbrot from the trenches of Verdun. It could have saved quite a few lives – if used as impermeable shield against flying shrapnel! 16. Freerk Bos (BreadLab) shares his very special relationship with Goethe’s Götz – he was the first (and probably only) student who ever checked out this drama from the local library! 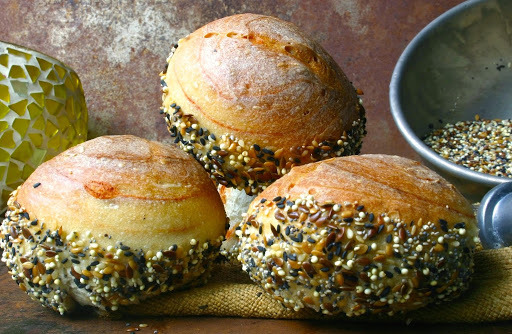 Little rolls, with a paprika-chili spiral, dipped in seeds – I can’t think of a prettier way Sturm und Drang became bread. 17. Gary Turner (The Fresh Loaf) did some research on food in medieval times. 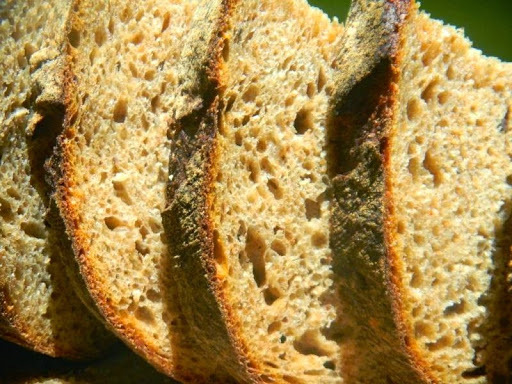 Whereas common people had to eat coarse rye and barley breads, only finest wheat was good enough for the higher classes. 18. Ian Sandman’s (Mookie loves bread) four-legged kitchen helpers would have rather baked for the mysterious Black Knight without hands (from the Artus legend), but could be persuaded that at least one hand was needed to handle this rustic loaf! 19. For health reasons Janet Cook (The Fresh Loaf) cannot eat her beautiful loaves herself, but that doesn’t deter her from indulging in her bread baking passion: making her neighbors happy. 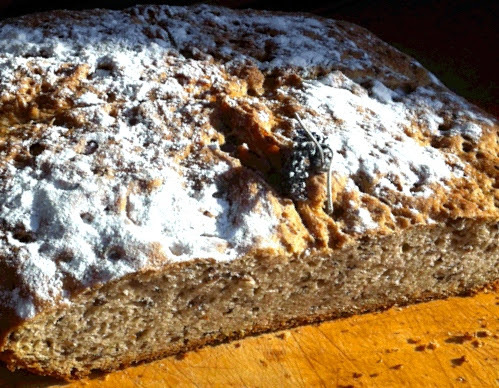 Inspired by medieval drinking habits, she added a barley mash to her wheat spelt bread. 22 + 23. 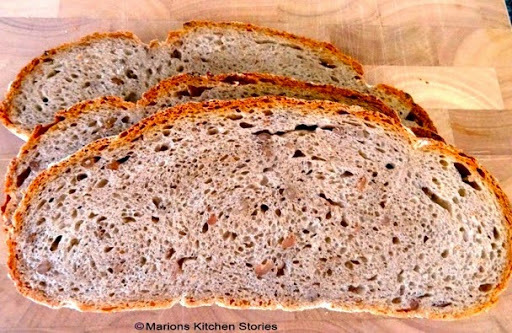 Jürgen Krauss’ (The Fresh Loaf) spelt bread comes in two variations, with light or green spelt. 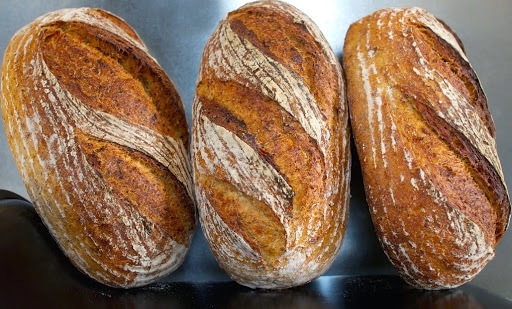 You can also choose between a purist version, or a loaf seasoned with nettle and fennel. Served with goat cheese the nettle version earned him his family’s Annual Culinary Awards! 24. I wanted to use my favorite flours, spelt, einkorn, rye and barley my own bread, and give it a medieval touch with a millet porridge. My bread guinea pig husband and I liked it a lot! 25. 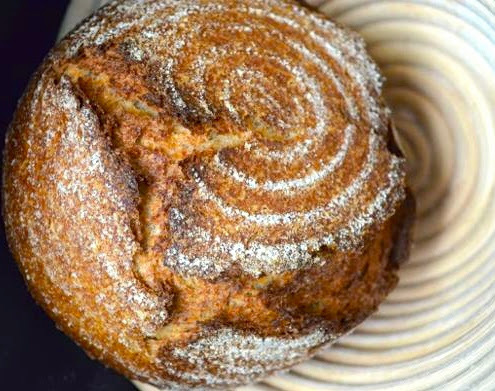 Even in faraway Dubai, Khalid/Mebake (The Fresh Loaf) bakes with freshly milled organic wheat, rye and spelt flours from Germany. His loaf tastes smoky, nutty, slightly acidic and caramel sweet, since it’s made with a raisin soaker. Khalid’s Götzenburg Bread – from Dubai! 26. Marcus/Wassisname (The Fresh Loaf) wondered, what kind of loaf he might offer Old Götz nowadays, and opted for a wheat bread with barley, oats and flax seed. Everybody who tried it enjoyed his GÖTZENBROT. And if anyone doesn’t like it? Well… thanks to Götz von Berlichingen, Marcus knows just what to say to those wimps! 28. No wonder that Ninive (Ninive Loves Life) took up the challenge to help fill the bread basket for Old Götz – her maiden name is Götze! 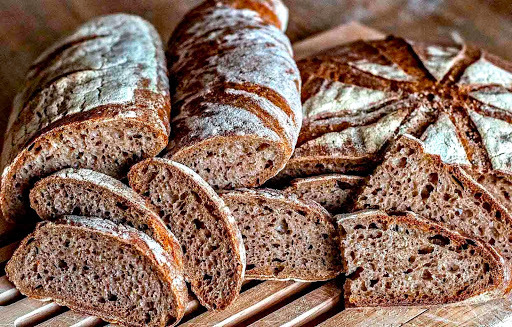 Her WHOLE RYE BREAD FOR GÖTZ, made with coarse rye meal, beer and molasses, develops its good taste during long, slow fermentation. (Ninive’s blog is bilingual, German and English). 29. Sam Kargl (Sam’s Kitchen) wondered how traveling noblemen and their followers prepared their food when when they had no oven. Surely they would have brought a kettle! 30. Susan (Facebook) bakes this 1.8 kilogram heavy weight every week, and thinks a bread that she and her neighbors have enjoyed for years, should certainly please an old knight, too. (Susan has no own blog – please, contact me for the recipe). Tolle Brote! Kann gar nicht sagen welches ich als erstes probieren wollte…..am liebsten würde ich alles Rezepte mal durch probieren. Danke, Mia, ich hab bisher drei probiert, und sie waren alle sehr gut.